Roger Bisby test drives some Solid Gear One GTX safety shoes. These Solid Gear safety trainers stand out from the crowd because of their bright colour but the real difference is hidden under the waterproof star knit GORE-TEX surround. The secret is all-round breathability and that includes ventilation up through the sole. If you look, the sole and heel resemble a Bison beam floor or trusses if you want a building analogy. The air is able to travel up through the sole and heel and the moisture wicks out through the GORE-TEX. Is this just a gimmick? I must admit it crossed my mind but looking into it a bit more, I found that the S3 rating on these shoes not only gives protection against standing water and spray but the double deck of EVA rubber is heat resistant and highly puncture proof. The high level of moisture wicking and air circulating across the sole also helps. If all else fails, the lining is antibacterial – which means they shouldn’t end up smelling like a damp dog. Not that my feet stink, you understand. All this technology made me realise that wearing them indoors in a low risk environment is not really giving them a full test so I will be taking them out for a proper spin just as soon as I finish installing this bathroom. Watch this space, as they say, because the outdoor test is yet to come. My concern is how those cavities cope with mud. I can see a situation where they fill up and then, if I wear them indoors and the mud dries, it drops out in small chunks, even though I have wiped my feet. What I really like is the flexibility of the sole. 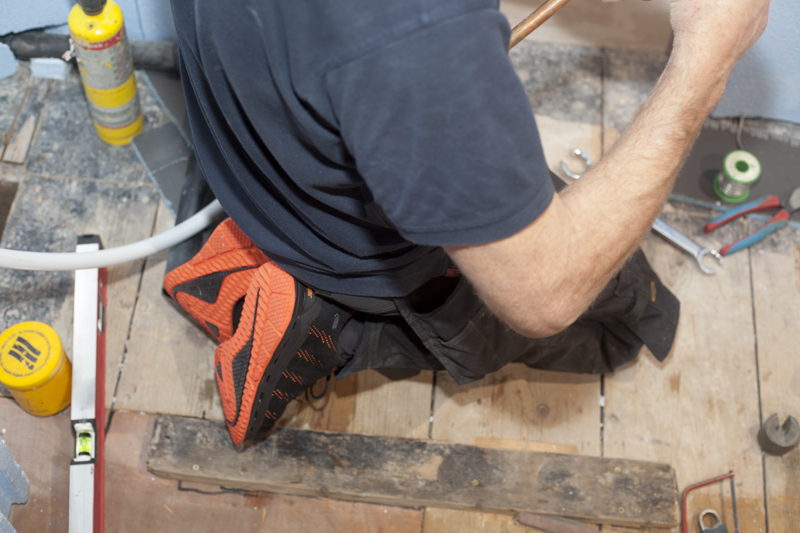 For many trades, this might not be an issue – but for a plumber or electrician, flexing feet and kneeling down all day long is routine so any midsole protection has to be capable of bending constantly without coming out through the sole. As a final note, I am glad to see that with these shoes Solid Gear has returned to a system of lacing that goes through the shoe rather than those silly fabric loops. They might be ok in some environments but, as every builder knows, cement is very good at rotting laces and fabric. That said, if you are a wet trade then you probably wouldn’t choose this particular model. Luckily there plenty to choose from in the Solid Gear range.